Today I tried out a car that I've been a big fan of—at least in theory—for a long time: a Porsche 944 Turbo. I've thought about getting one off and on for probably about 10 years now, but it never quite got around to driving one. This car was an '86 with 101k miles, some kind of lowered suspension, a 930 steering wheel, and a bolt-in rollbar in the back seat. Overall, it was in pretty good condition, with one major exception which I'll cover later. Honestly, even though I like the overall car, I don't think looks are its strong point. It's boxy, and a bit dated-looking. It's ok. The boxed fender flares appeal to the gearhead in me, but I don't think it would ever be accused of being pretty. The Turbo front fascia and lights look way better than the regular 944 at least. The rear bumper is pretty hideous, but GT Racing makes a fiberglass replacement that cleans the looks up considerably. I rather like the 944 Turbo on the inside. There's decent enough room although headroom for me at 5'11" is a bit tight. But compared to a 911 of the same year, there's way more room for your feet, and there's actually some separation between the seats. It feels much less cramped, but there's less headroom. The seats are comfy and have plenty of adjustments. Pedals are well placed, there's a good foot rest, and visibility is excellent. I'm usually not a fan of tan interiors, but with the black dash top and floor mats, the tan here works for me. Ergonomics overall are pretty good. The switchgear for the most part makes sense. The only real quirk is the power mirror adjuster joystick is on the driver's door, but the switch to choose which mirror to adjust is in front of the shifter. Not really a big issue in the scheme of things. Overall, I'd be pretty fine with taking this car on an extended road trip. It is...pretty decent. Not fast enough to really pin you back in your seat, but it feels healthy. For a mid-80s turbo motor, I was expecting more lag, but it wasn't that bad. It feels a tad quicker than say, a 986 Boxster S, even though it's got less power. Could be either due to torque or gearing. Or just because the 986 S is too damned quiet. Assuming you do proper maintenance on the motor, you can pretty easily extract more power without too much expense. An '88 Turbo S or '89 Turbo (since all '89 Turbos got the Turbo S goodies) would be a bit of an improvement. After my experience with an '86 911 being possibly the worst transmission I've ever experienced (although that particular car most likely needed some transmission work), I was a bit nervous about the transmission of the 944 Turbo. Turns out I needn't have worried. It's quite nice. The clutch wasn't particularly heavy. It engaged slightly high up in the pedal travel but that could be due to age/wear. The shifter is rather good with reasonably short throws and well-defined gates. It has a nice snickety feel. No ropeyness here. It's actually better than your typical modern Porsche or BMW shifter. I wouldn't quite put it up there in my top shifters ever though—those remain the Miata, S2000, RX-8 and FD RX-7. Heel-toe downshifts were easy enough. Here's where things got a bit off the rails. This car had steering issues. It didn't track straight, but it wasn't tramlining. There was some kind of weird play in the steering. Going down a straight road, it would pull to the left, then the right. Turning in to high-speed sweepers was a bit scary, because at first I would turn the wheel and nothing would happen. I'd have to keep turning the wheel and eventually the car would turn in. Not good. I did some research and it could be due to bad tie rod ends, or the steering shaft itself, or the shaft U-joints. Hard to say without getting under the car. This car was lowered in some way, no idea on what sort of parts were used. That could also be contributing to the problems. Once I got the car turned in, I liked how it handled. Body roll was well-controlled, steering the car with the throttle was easy, and overall it was mostly nice. Just the steering issues were a bit scary. Grip was decent, but it didn't have particularly great tires. Yokohama AVS ES100 on the front, and General Exclaim UHP in the rear. Ride was actually very smooth, especially considering how low the car had been dropped. Pedal was reasonably firm, but not rock hard like you need to exert yourself to get the car slowed down. Stopping power was good. I didn't really push them though. There are also plenty of upgrades out there, from better pads/rotors, to going for bigger brakes from other Porsches, other aftermarket big brake kits, etc. I didn't turn the stereo on. Oops. This car had some kind of 'Bullet' aftermarket exhaust. I'm not sure what exactly that means, but the exhaust tip said Bullet on it. Best info I could find was the Bullet Performance Muffler site, which looks like they just make mufflers and tips. So I think this was a "custom" muffler shop job. Sounded pretty alright though. Not as good as the M Performance exhaust on my 135is, but that's a particularly good sounding exhaust. Ehhhhhh.....that's a tough question. I can now confidently say that I like 944 Turbos. I'm not so confident about this particular car's steering problems. Another consideration is this particular car doesn't have an LSD. Before I drove the car, I did a little research that told me not all 944 Turbos came with an LSD. Porsche put a build sticker with option codes in the hatch area under the carpet, and the option codes are available online. LSD is option code 220. So I checked the sticker. The option codes are the little 3-digit numbers at the bottom. No option code 220. There are plenty of available LSD and torque-biasing diffs out there. 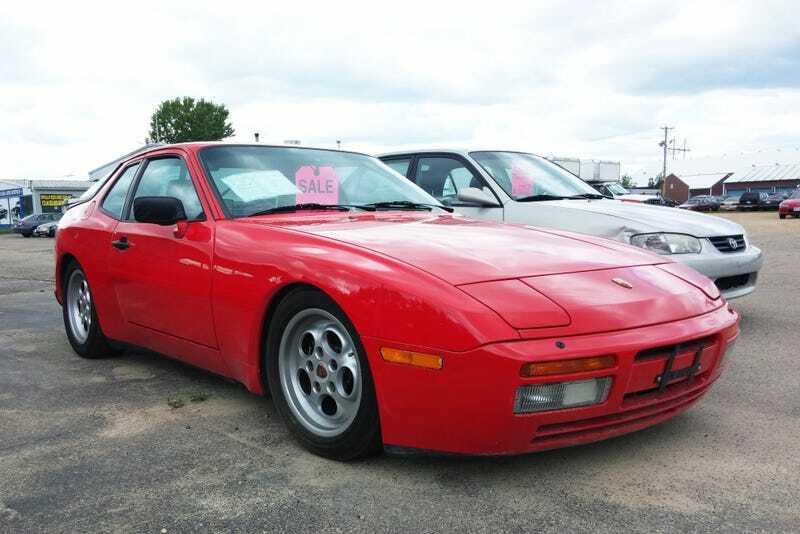 Or you can swap in an LSD-equipped transmission from either a later 944 Turbo or a 944 S2 (the S2 also has shorter gearing which is apparently desirable). But...none of those options are cheap. The guy said he'd sell me the car for $7200. Which is an ok price. But without knowing what is required to get the steering sorted, and particularly with knowing how much it'll cost to get rid of the open diff, I'm not sure this is my best move.